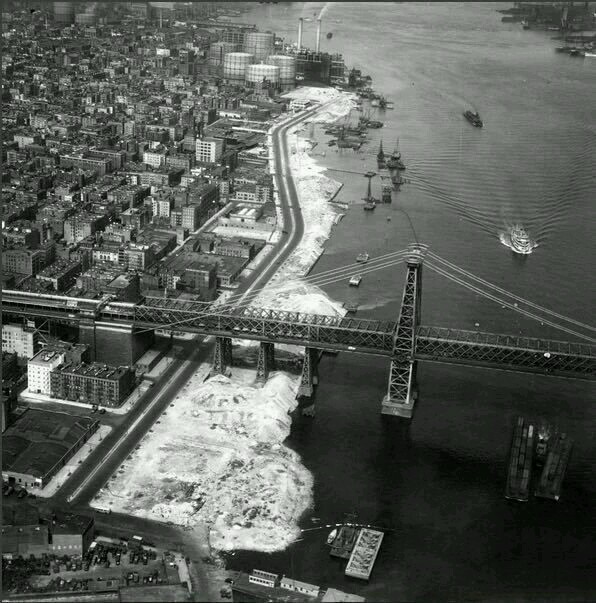 A stunning image posted from our friends at “The Lower East Side” Facebook page; The East River Park under construction sometime around 1937. Old warehouse buildings against The River, now long gone, remnants of the industrial rise of New York City in the late 18th and early 19th centuries. Pictured here, the City’s transformation of its coastline from one of industry to one of parkway and leisure. Steadfast and solid, bisecting the picture, is the Wiliamsburg Bridge; constructed at the dawn of the 1900’s. An Urban Image can be so telling; in this instance a City Kinetic. Virtually all of this landscape is different now, save for the bridge and the river that runs through the churning maze of Lower Manhattan. A new buffer constructed against the decaying storefronts awaiting their next chapter to be written. Thank you readers for your continued interest in our blog throughout 2015. 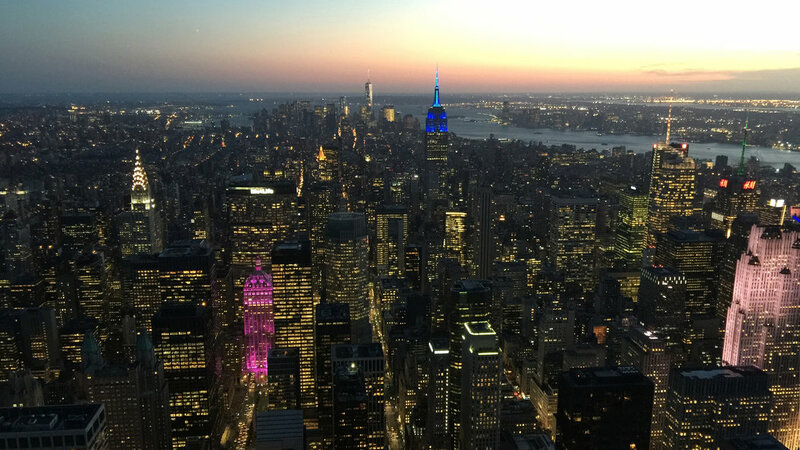 Gordon’s Urban Morphology has grown substantially in readership over our prior year as we continue to highlight subjects in New York’s built environment which have galvanized The City in one way or another. So, there you have 2015’s top posts. Thanks again for your readership and stay tuned for 2016 where we’ll continue to strive to bring fresh perspectives on our Changing City. Happy New Year from Gordon’s Urban Morphology. 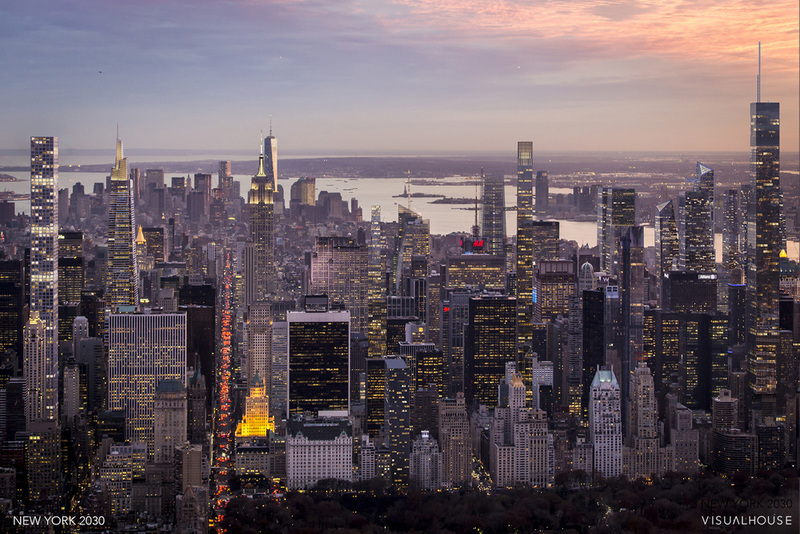 A compelling image has been released by Manhattan architectural graphics company Visualhouse, depicting the Manhattan skyline as it will appear with all of the planned and to-be-built towers coming down the pipeline. Mesmerizing yet also familiar; The pictorial takes into account all of the “Supertalls” planned for the West 57th Street corridor, as well as the Massive Hudson Yards complex rising above the Westside rail yard. Mesmerizing yet also familiar. The fascination with the everchanging skyline (this blog included) encapsulates the capacity for imagination and wonderment. Perhaps it is Awe in the collective constructive achievements of Mankind? Individual feats, brought together by teamwork and assembled into a massive agglomeration? This agglomeration creates that feeling of the familiar and is a nod to a form of Expectation: The Gestalt of New York. Manhattan 2030 really is not that much different from Manhattan 2015, 2000, or 1975 for that matter. Differing socio-economic and geo-political circumstances aside, The City just grows and multiplies based on the prevailing forces of Market Capitalism. The seemingly familiar driver behind The Mesmerizing. Step back within any of those eras, and The Skyline consistently captivates. It has, and always will remain a symbol of Destiny Density; of a collective will-to-improve. The Skyline also serves the memory as a Projection of Dreams, where people cast their own visions onto that familiar skyline, constantly changing in the blink of an eye. Visualhouse, a unique Manhattan architecture and urbanism branding company. Imagining the Megatower Filled Manhattan Skyline of 2030, from Curbed New York. An interesting link to the geography of Door Mapping, as a retrospective work of art by the Artist Roy Colmer (1935-2014). 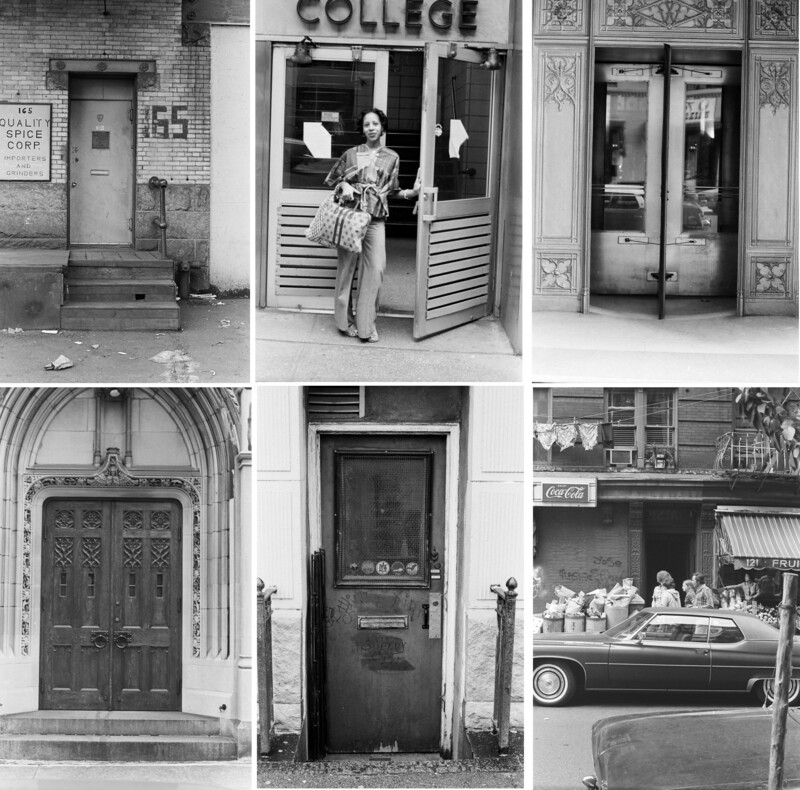 These snapshots capture New York entryways in a moment of time, but remind us of a static New York, one that is not constantly changing, but in this case, revolving. Often mundane and everyday, these doors mark the entryways to many homes and businesses across The City. Some are still around. And some have vanished with the passage of Time. The historical collection of photographs can be found at the New York Public Library. The Urban Critic: The latest critique of the World Trade Center Tower feels all too much the same; Planning that did not reach full potential, missed opportunities, too much government intervention. Written by Michael Kimmelman in the New York Times, the architecture review instead focuses on the surrounding socio-political context which brought the building into existence, and much less on the building itself. After reading the full article on The World Trade Center Tower, there is something in the tone that seems to ring familiarly hollow. Perhaps it is the expectation that a national newspaper, none other than The Times, should strive to act responsibly in creating a rallying cry around one of the most symbolic of National Treasures. Perhaps it is in recognizing that the symbolism of this particular place, in whatever form it ultimately takes, will serve to make a permanent impression on the memories of the Greater Public. The buildings’ vertical punctuation mark in the sky; The reflectance of the glass facade beaming sunlight onto a Frenzied City; The illumination of the Trade Center Spire at night. All of these positive attributes, over time, will serve to outweigh the fleeting opinions on the disaffectations of symmetry and stuntedness. These attributes, as proclaimed by the author, are detrimental qualities that The Tower possesses. 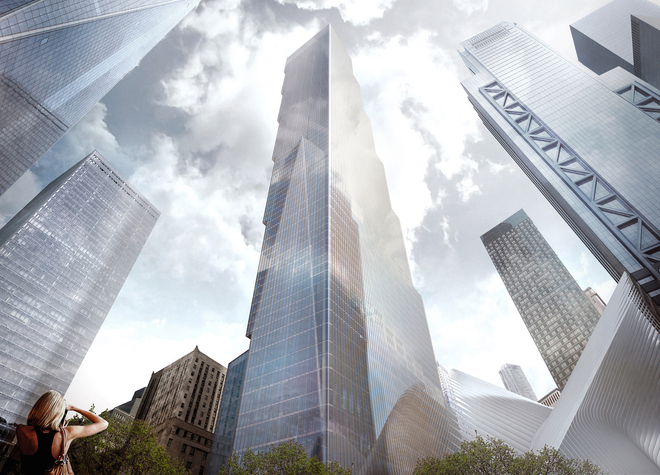 In the end, The Trade Center Tower occupies The Ultimate Space of a Nation that was attacked. Positioned off to the side of Two immense shimmering voids in the landscape, representative of Loss; The Tower defers to a hallowed ground which strives (and succeeds) in creating a feeling of collective unity. Perhaps the Towers’ only necessity is to stand tall and with a strong silhouette, which it does, and need not say more. A silent gatekeeper on the tip of Manhattan shore. New York Times Critique on The World Trade Center, by Michael Kimmelman. Scalar Absence, and the World Trade Memorials, from Gordon’s Urban Morphology. World Trade Rising, from Gordon’s Urban Morphology. 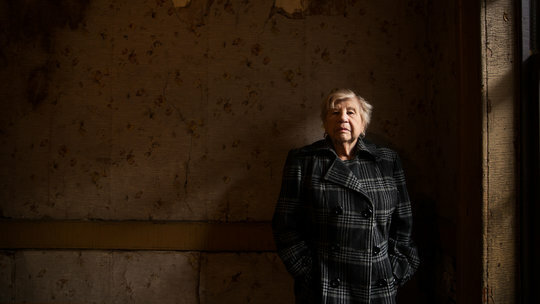 Rita Ascione, the last remaining former resident of 97 Orchard Street, now the New York Tenement Museum, recently made a pilgrimage back to her former home. This journey was chronicled in a New York Times Piece, where she recalled life in The Lower East Side back in the 1930’s as Rita Bonofiglio, member of an Italian Immigrant family amongst many others. 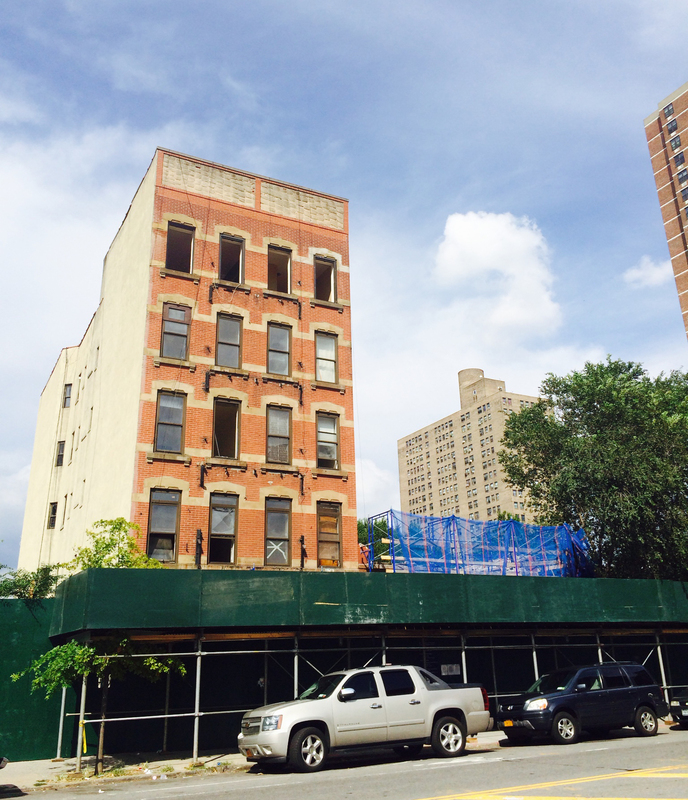 Harkening back to one of our prior posts on The Museum which recalled the old Tenement Windows, one can imagine Ms. Ascione ascending the staircase to her apartment and approaching the window where she looked out at such a young age. A lifetime has elapsed in between, with memories spanning decades. In a poignant ending to the article, Ms. Ascione comments that the neighborhood “is alright,” a nod, one can say, that even as the forces of change sweep through Our City, some things just don’t change as much. Perhaps it is the familiarity of surroundings, the scale of the buildings, or an echo on The Street. These personal recalls must be preserved over the life span of time, much as they have been for Rita. For as The City churns through its machinations, it will always be a Collector of Memories; Made to be Revisited. For a link to the New York Times piece about Rita Ascione, please click Here. For a link to Gordon’s Urban Morphology’s Memory Piece on the Tenement Museum, please click Here. 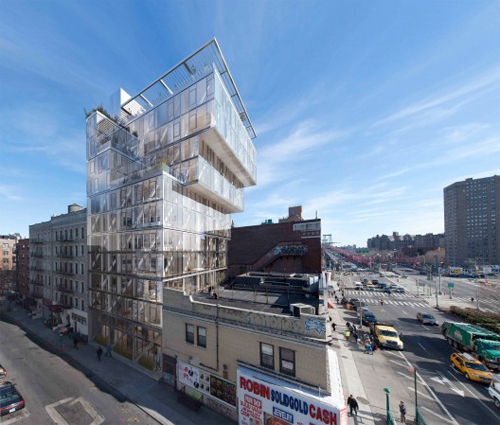 The New York Times has featured the newest Rich Enclave Addition to our Urban Landscape this week in an article focusing on Building Height. 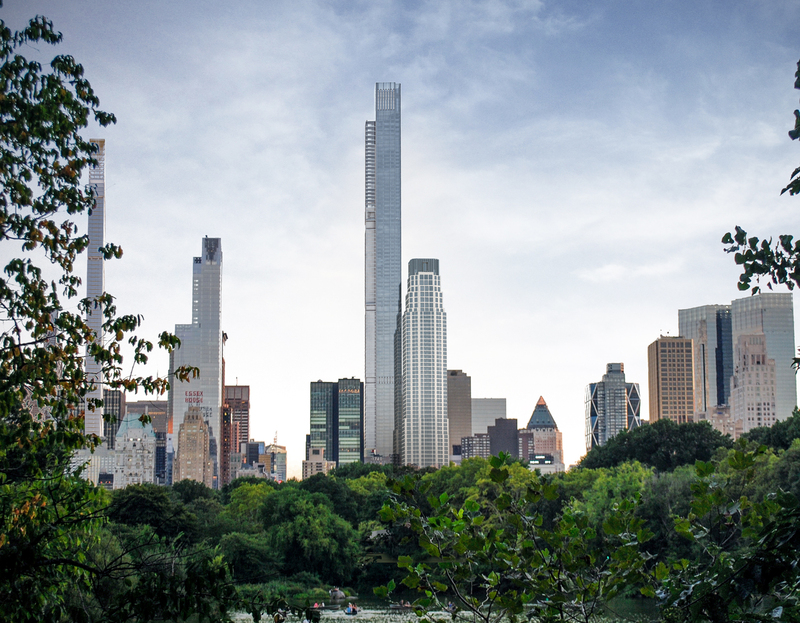 Thin, tall and making an impression, The Rafael Vinoly Tower has proven to be quite a stunner. You can read more about Its Skyline altering views and watch a video from The Pinnacle Here. 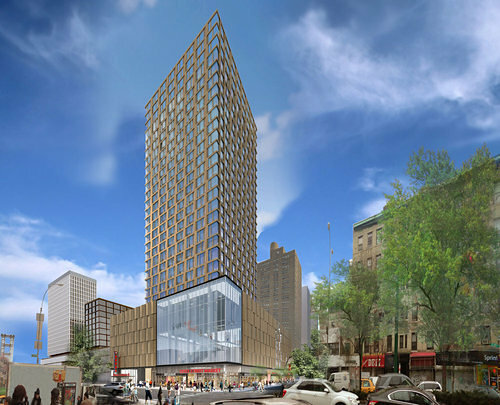 Highlighted in a prior post “New York’s Next Tallest, Climbing” , our site continues to seek threads which bind The City and its built environment together. As a marker of memory, it remains to be seen. For visitors, the vision of a pencil thin obelisk may not be the primary impression people remember, but it may somehow linger in the background. For those of us residing here, The Tower will likely serve as an object for orientation. So despite the elitist nature this structure stands for, it has nonetheless become a symbol of our growing Metropolis. In the corner of one’s eye. The Center of New York.